Mohs Micrographic Surgery is a specialized, highly effective technique for removing skin cancer. Dr. Frederic Mohs developed this procedure in the 1930s at the University of Wisconsin. The surgery is microscopically controlled and allows for precise and accurate removal of skin cancer tissue. It is now practiced throughout the world by Mohs-trained surgeons, and it is recognized as the skin cancer treatment with the highest reported cure rate for skin cancer. What Makes Mohs Surgery Different? Many skin cancer treatments are often complicated by the removal of either too much healthy tissue, or too little tissue – leaving behind affected cancerous tissue. Mohs Micrographic Surgery differs from other skin cancer treatments in that it allows for immediate microscopic examination of cancerous tissue. During Mohs Surgery, thin layers of tissue are removed and immediately examined under the microscope, thus allowing the Mohs surgeon to inspect all tissue surrounding the tumor and detect any remaining tumor extensions. The remaining affected tissue can then be mapped out and removed, while allowing the surrounding healthy tissue to be spared. 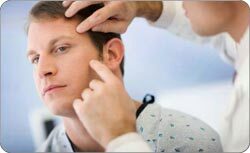 At Dermatology of Eastern Idaho, Mohs Micrographic Surgery is performed as an outpatient procedure in the physician’s office. The patient is awake during the procedure. For the surgery, a local anesthetic is used to numb the area, after which the doctor removes the visible cancer and takes it for processing. This generally takes about 45 minutes. Once the tissue is processed, the doctor examines the slides to determine if any cancer remains. If residual cancer is found, the doctor will remove additional cancer only where the cancer is still present. Then the processing will start again. If the cancer has been removed completely, then the site is ready to be repaired. There are several options of how to repair the defect, and the doctor will discuss these with the patient and help determine which is best for them. Learn more about Mohs Micrographic Surgery from the American Society for Mohs Surgery. Download the PDF pamphlet Important Patient Information Regarding Mohs Micrographic Surgery in the Treatment of Skin Cancer, provided by the American Society for Mohs Surgery. You can also learn more about Mohs Surgery by visiting the American Society for Mohs Surgery website at www.mohssurgery.org.